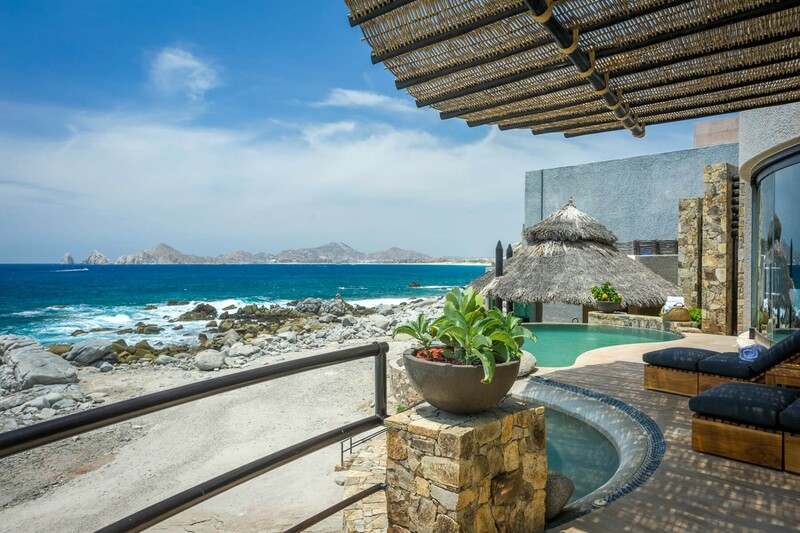 Embedded overlooking the glistening Sea of Cortez along Mexico’s prestigious coastline, is the exquisite 4-bedroom Casa Arrecifes. 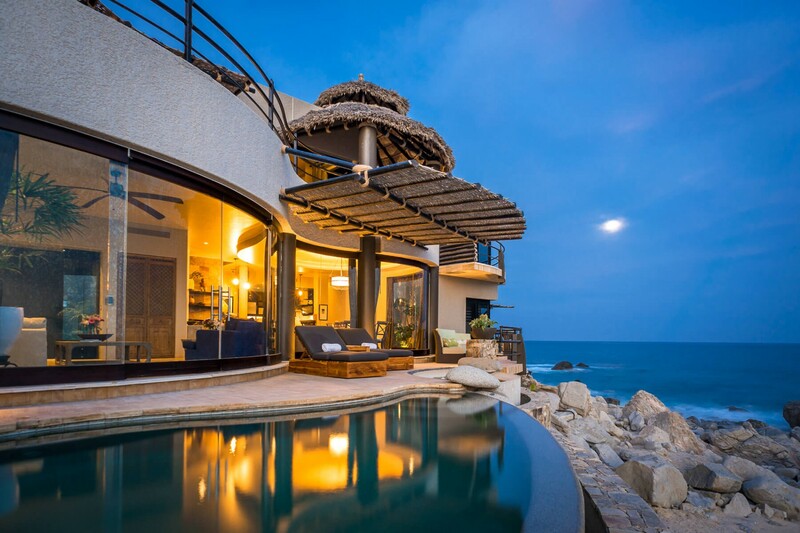 This luxurious villa can accommodate up to eight guests and indulges in modern interiors that blends seamlessly into the exterior living space. 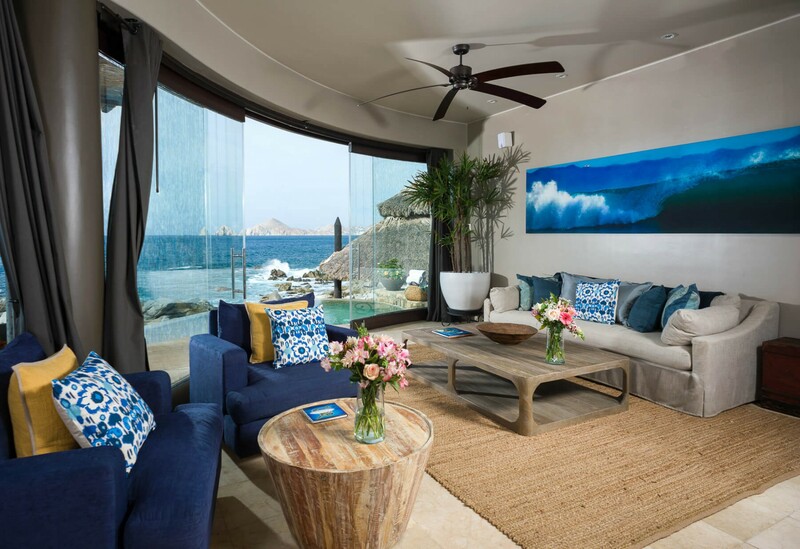 Based in Cabo San Lucas, this serene, oceanfront setting allows for panoramic views of the Sea and the iconic Arch. 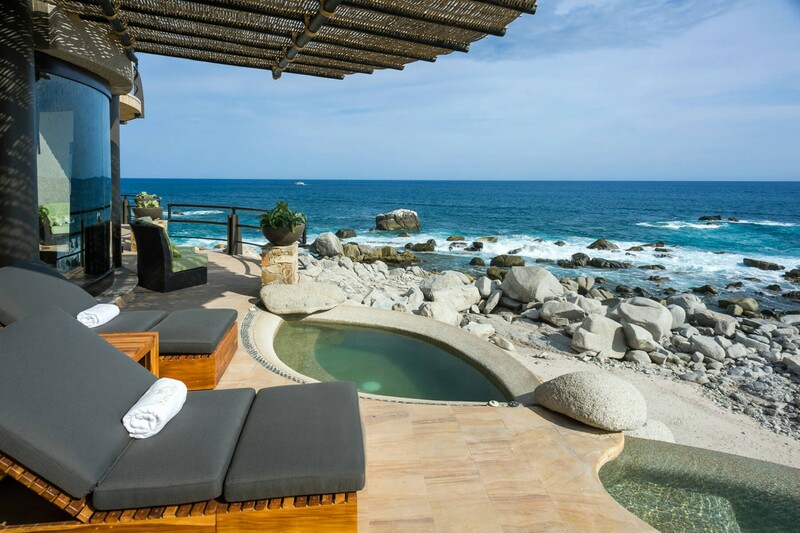 Experience the vibrant Mexican lifestyle in the comfort of your own private villa on the coast in Casa Arrecifes. 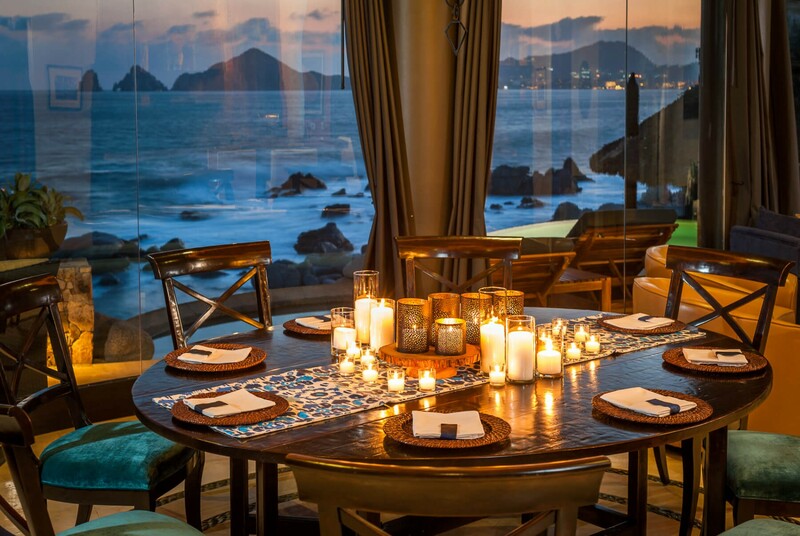 The Villa indulges in over 6,300 Square Ft. of living space, featuring unobstructed views of the sea. The property is surrounded by lush vegetation and landscaped gardens. 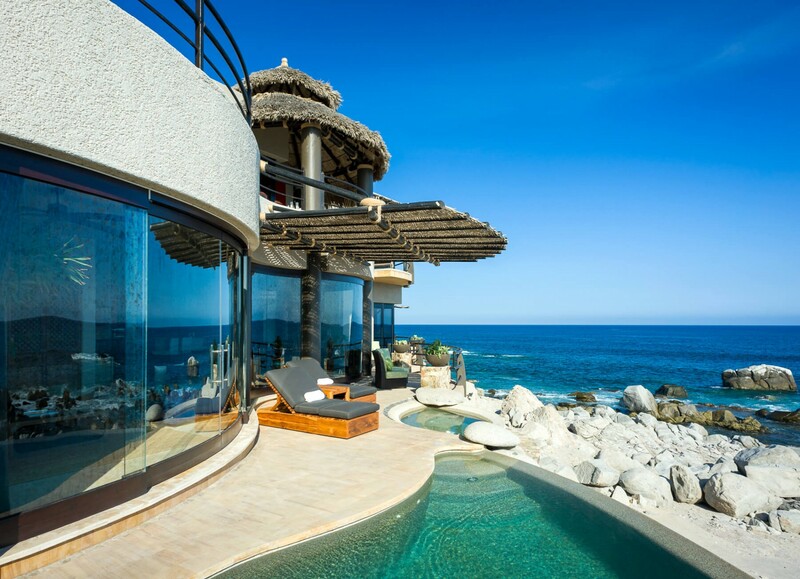 The villa is settled on the oceanfront and includes it's very own private beachfront. With this beach as your backyard, spending a day out on the sand is easy. Enjoy a refreshing morning walk along the shoreline, or if you desire a more sugar-fine, white sandy beach then the sought after Medano Beach is a short 400-yard walk. The beach is perfect for swimming and for some exciting water sports activities such as snorkeling or surfing. 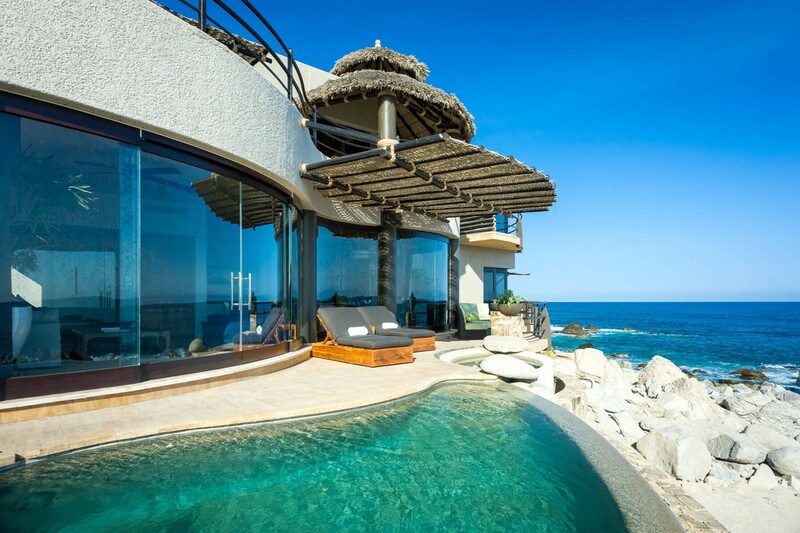 Casa Arrecifes features stunning architecture and modern designs that are laced throughout the property. 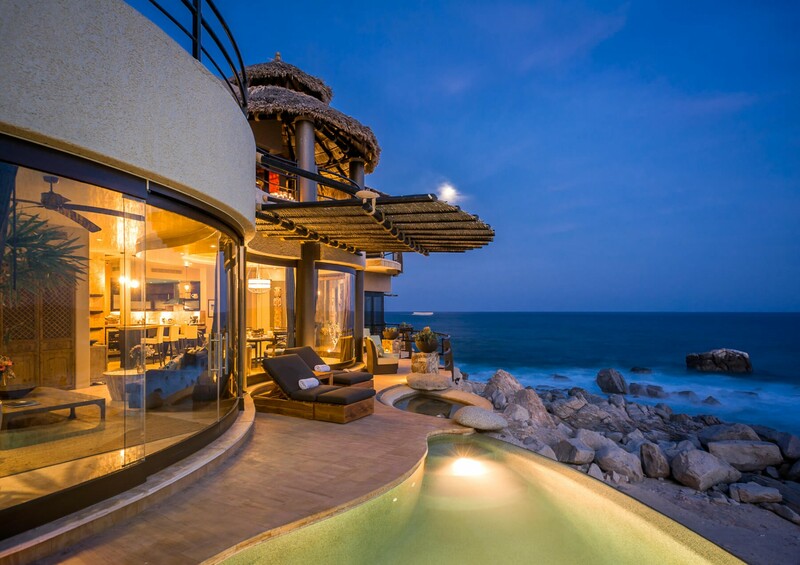 From the curved, ceiling to floor glass windows and doors that slide open, to the high-vaulted ceiling, the villa is overflowing in elegance and finesse. 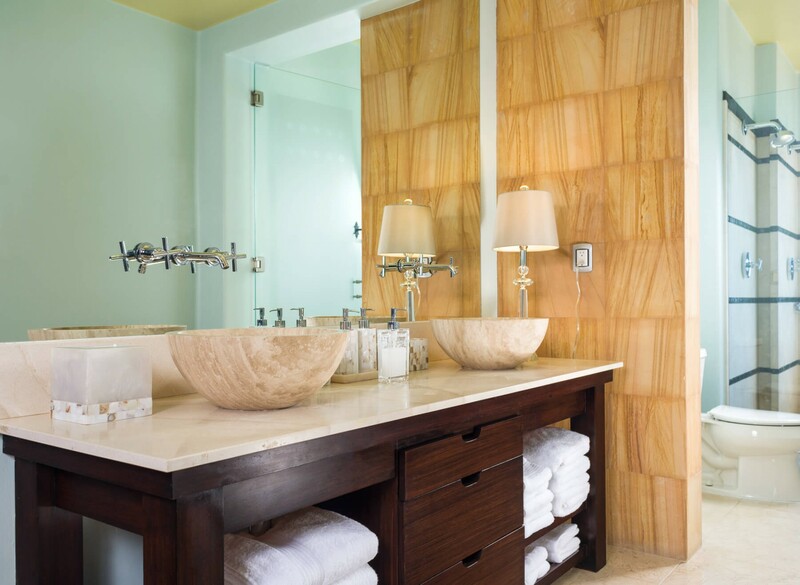 The interiors are richly appointed with a blend of stone and woodwork, mixing neutral tones accented by pops of occasional color set against the Seas dazzling backdrop. Making your way into the contemporary villa you will first come across the main living area. Here, the living, dining, and kitchen area blend into an open concept room. 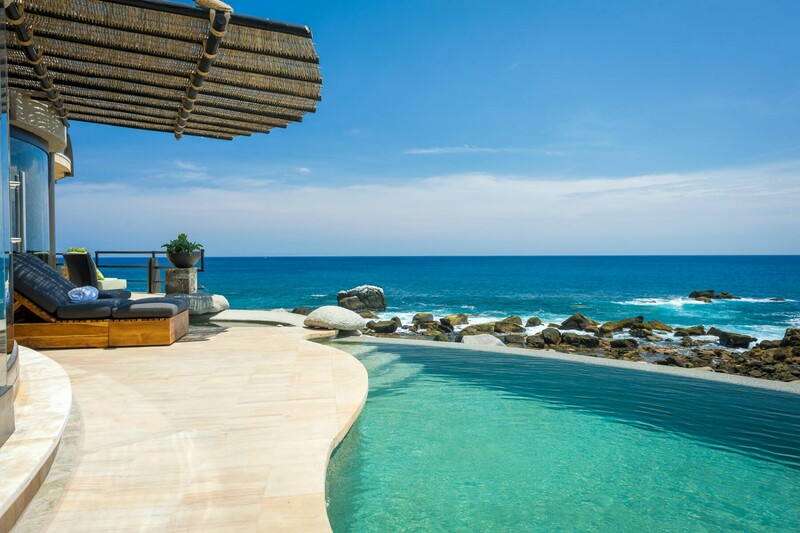 The space seamlessly transitions onto the pool terrace via the sliding glass door. 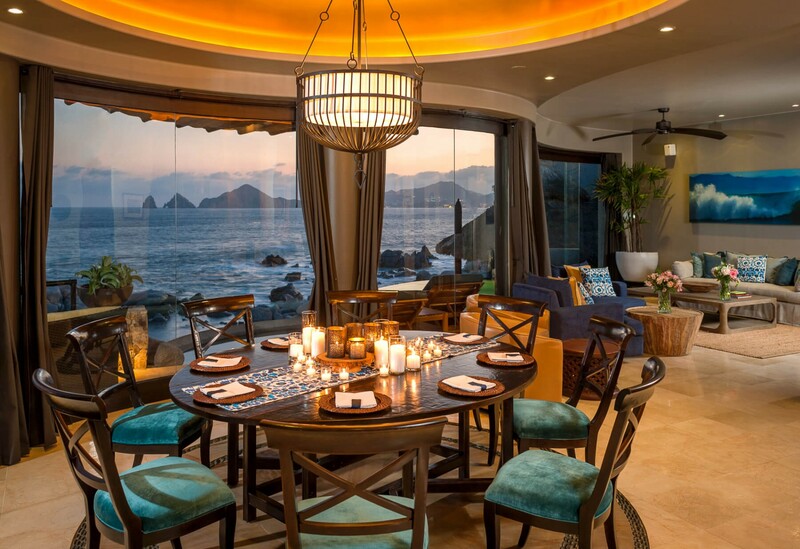 This living space features incredible views of the Sea and provides endless picture-perfect moments in the haze of glistening turquoise. 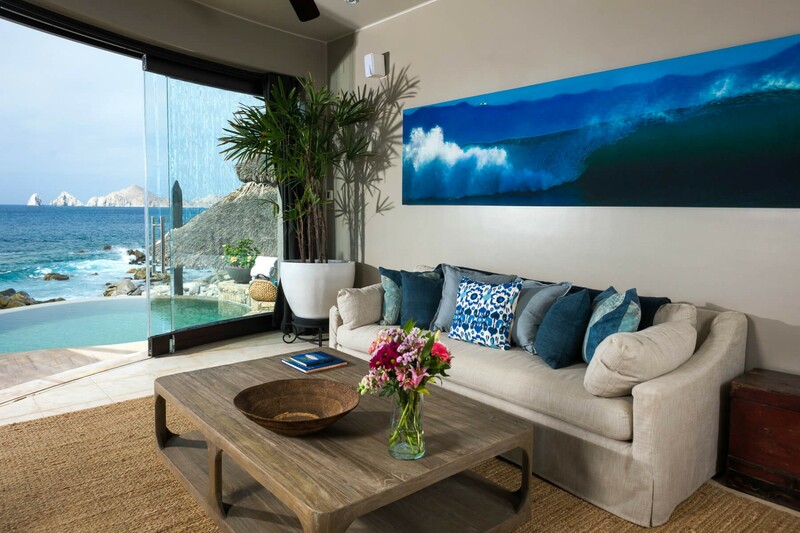 The living area sits directly in front of the pool and is fitted with plush sofas, dotted in vibrant blue and green cushions. The space is laced in tasteful paintings and artwork that adds to the serene ambiance and top-notch finishes. The dining area seats eight guests comfortably while the kitchens curved breakfast bar caters for an additional three guests. The kitchen comes fully equipped and ready for you to use during your stay, with high-end appliances and amenities. 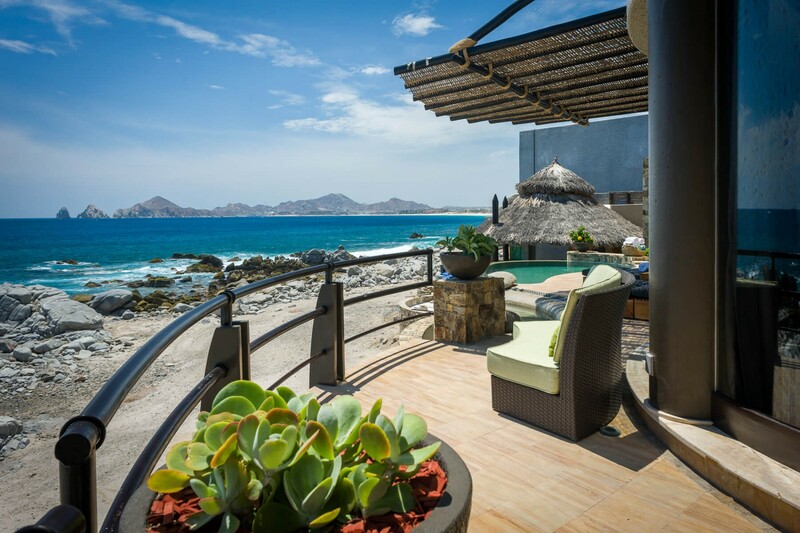 The oceanfront terrace is one of the key features of the villa. 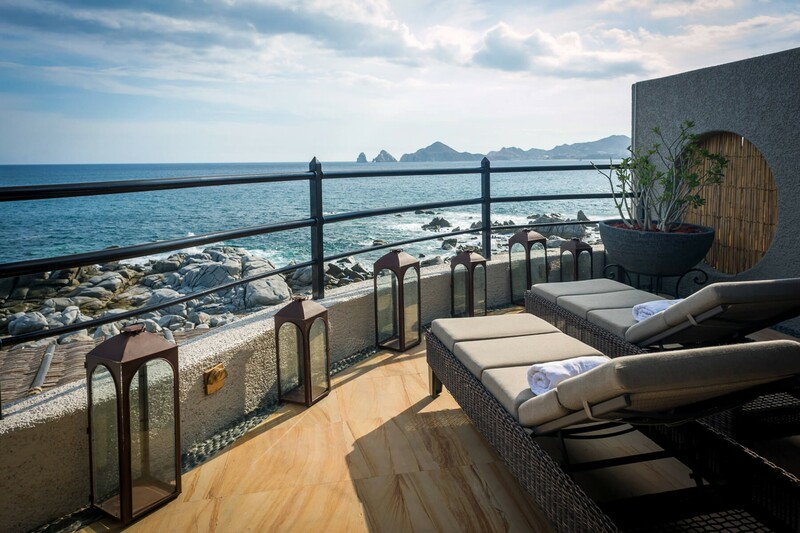 Each morning you can walk out onto the smoothly tiled terrace and soak in the incredible views. As the sun stretches over the property you can walk along the shoreline and listen to the gentle waves lap onto the shore. 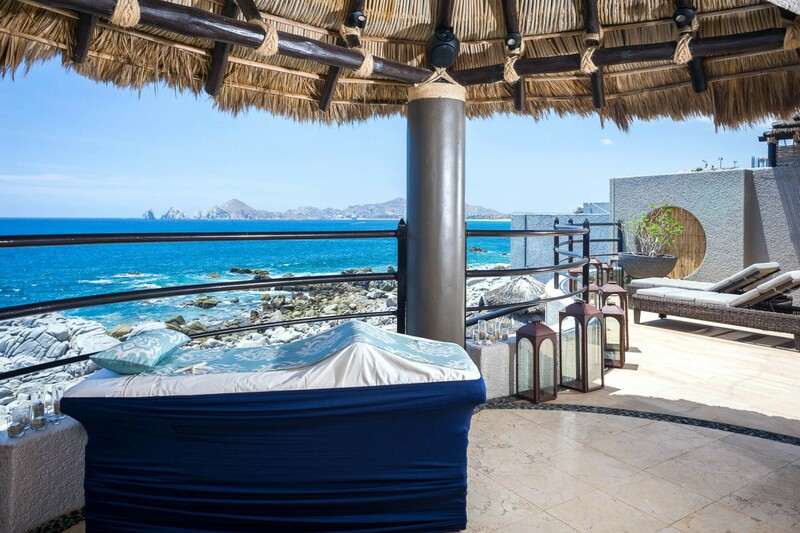 Dine alfresco under the palapa as you experience an authentic Mexican lifestyle. 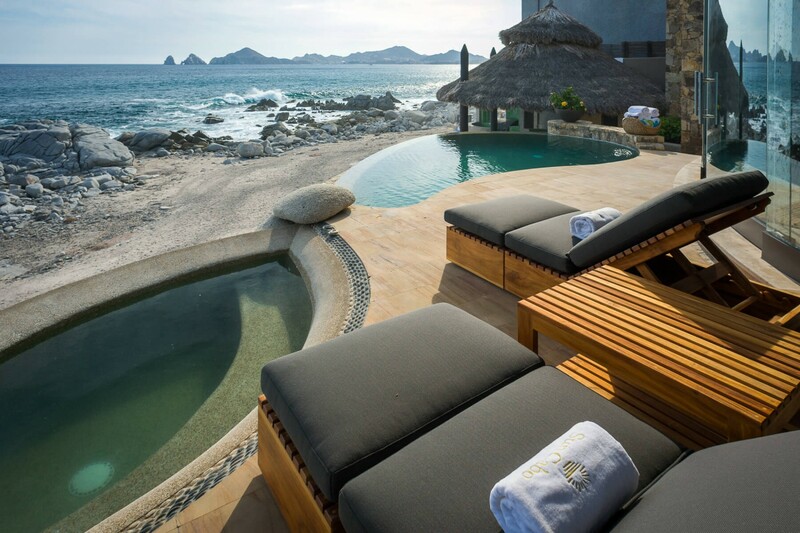 As the sun shines down, enjoy the warm ambiance as you lounge out on the sun beds. Watch as the surrounding landscape comes to life, bursting with color and floral scents that tinge the soft breeze. 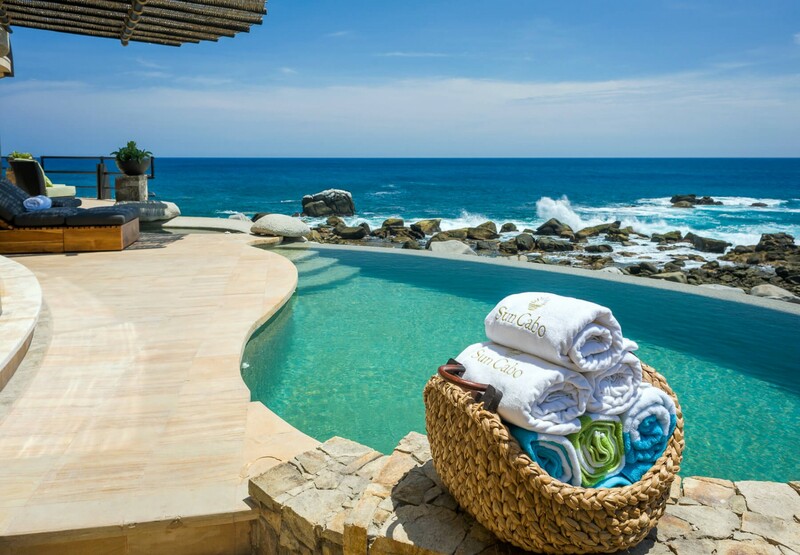 Slip into the refreshing silk waters of the swimming pool if you get too warm. 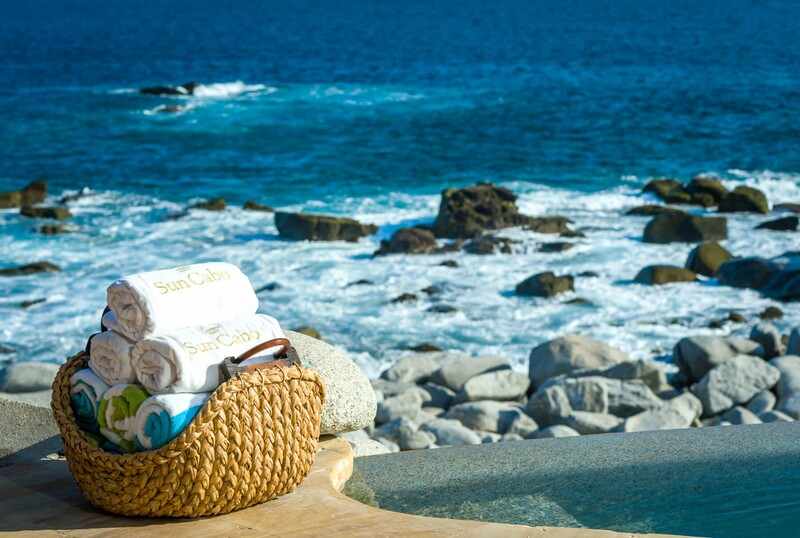 In the evenings you can indulge in the heated bubbly waters of the jacuzzi as you watch the stars shimmer along the night's sky. 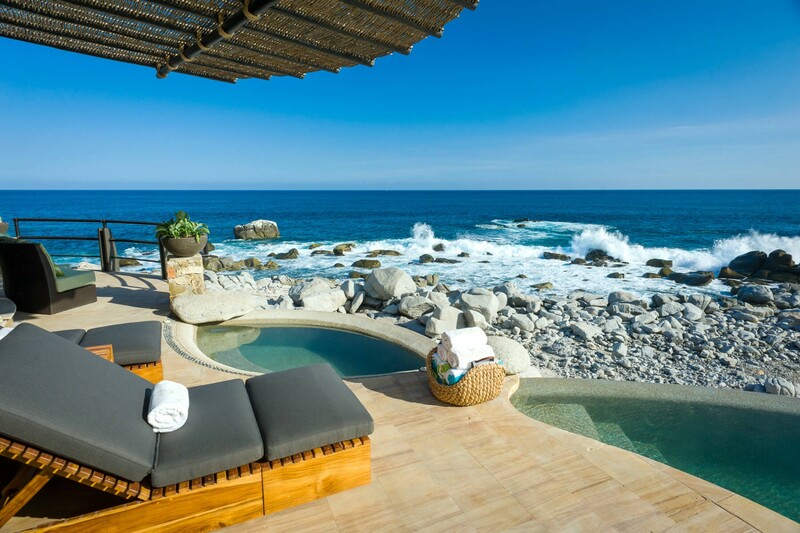 Each night you can unwind and fall asleep to the calming sound of waves lapping on the shore nearby. 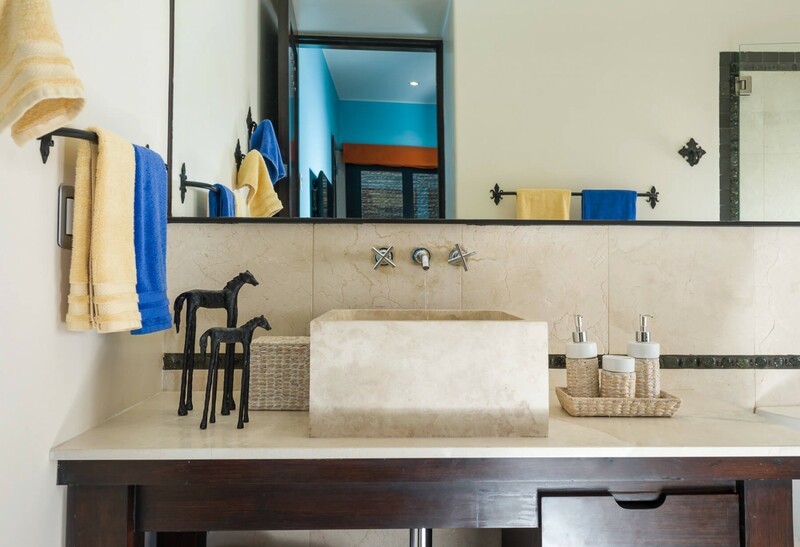 The villa has a total of four luxurious bedrooms, each boasting their own private en-suite bathroom. Three of the bedrooms feature views of the ocean via the large glass sliding doors while the fourth indulge in garden views. The master bedroom is fitted with a large- king-sized bed and offers high-end features such as a plasma screen TV, stereo system and an in-room safe. 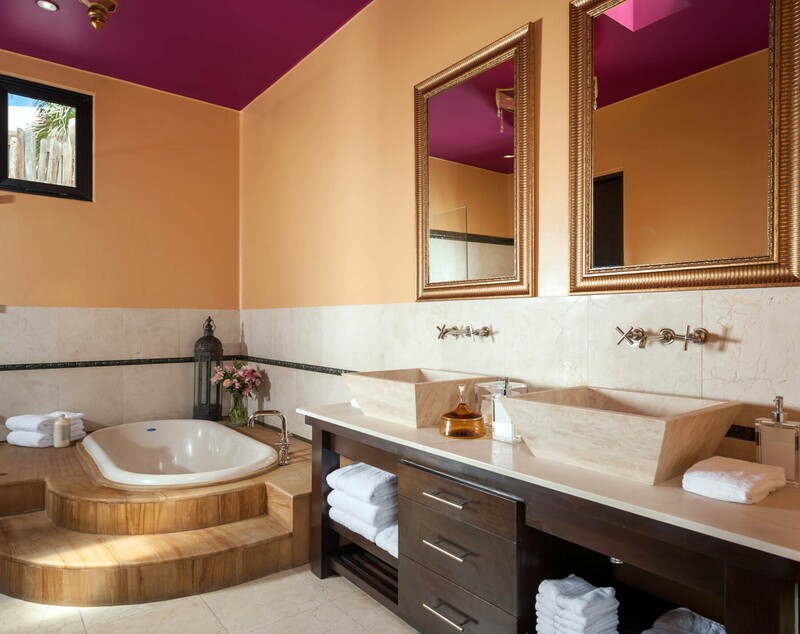 The en-suite indulges in a bathtub and shower. 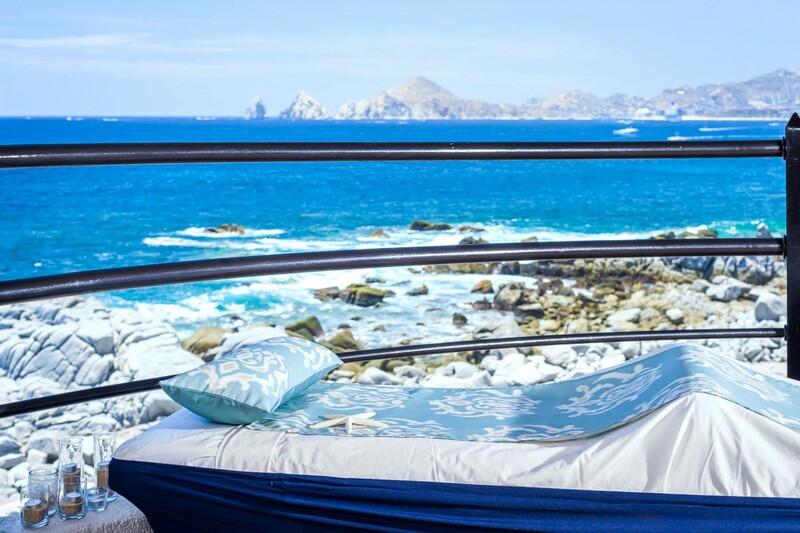 The master suite opens out onto the private terrace and enjoys unobstructed sea views. The second and third bedrooms both feature king-sized beds and en-suite with showers. 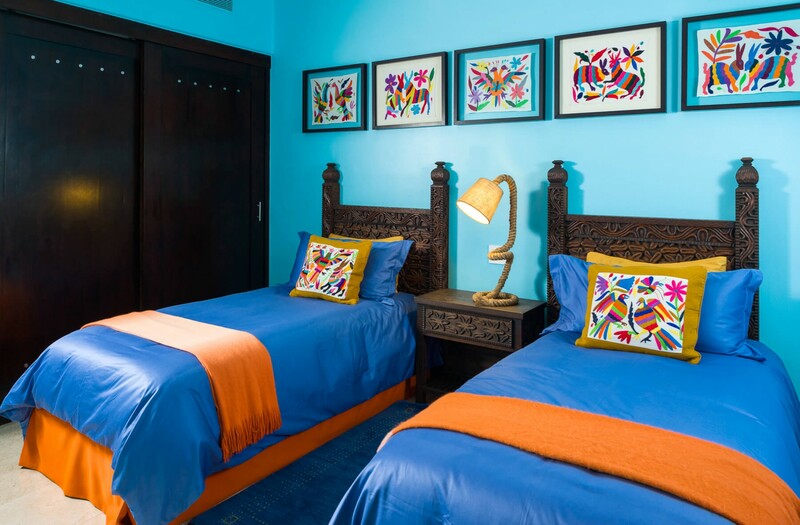 The rooms include plasma screen TV’s while one of the rooms offer access onto the terrace. The fourth bedroom has the option to be a king-sized room or converted into twin beds on request. Bedroom 1 Master: Luxurious King-sized Bed, Private En-suite Bathroom, Large Bathtub, Shower, High-resolution TV, Stereo System, In Room Safe, Access onto Private Terrace, Panoramic Ocean View. 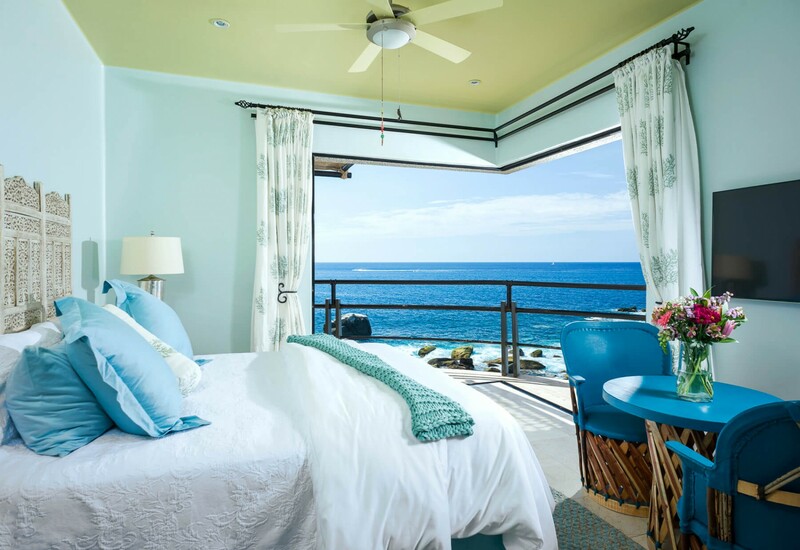 Bedroom 2: Luxurious King-sized Bed, Private En-suite Bathroom, Large Shower, High-resolution TV, Access onto Private Terrace, Panoramic Ocean View. 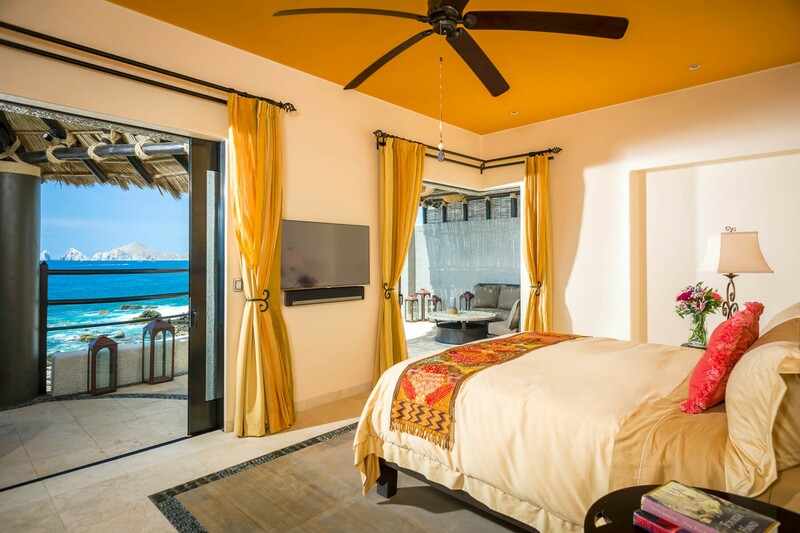 Bedroom 3: Luxurious King-sized Bed, Private En-suite Bathroom, Large Shower, High-resolution TV, Ocean Views. Bedroom 4: Luxurious King-sized bed (Can be converted into twin beds on request), Private En-suite Bathroom, Shower. 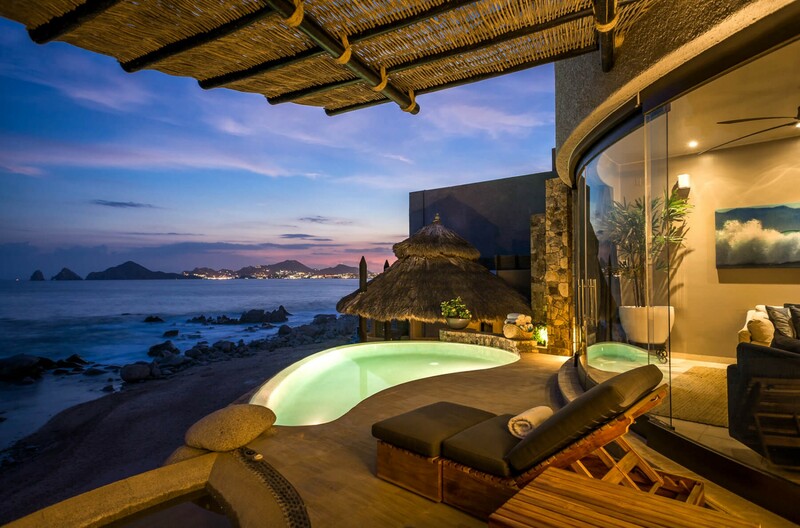 Casa Arrecifes is embedded on a private beach, overlooking the Sea of Cortez along Mexico’s prestigious coastline. 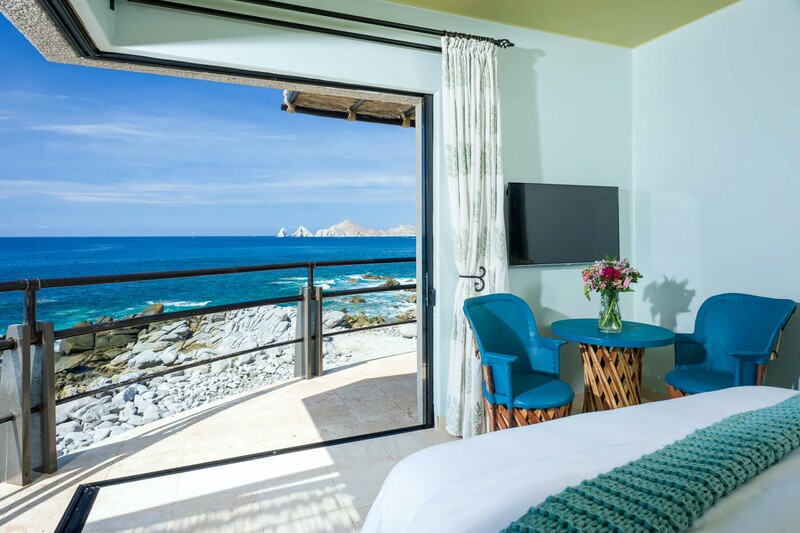 Specifically, based in Los Cabos - Cabo San Lucas, this serene, oceanfront setting allows for panoramic views of the Sea and the iconic Arch. 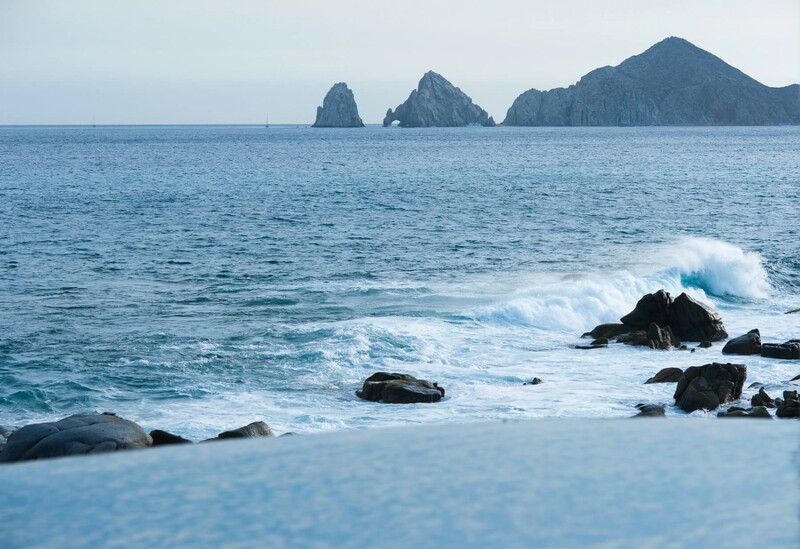 Cabo San Lucas is located along the southern tip of Mexico’s Baja California peninsula. This vibrant location is famous for its stunning beaches and watersports activities it offers. 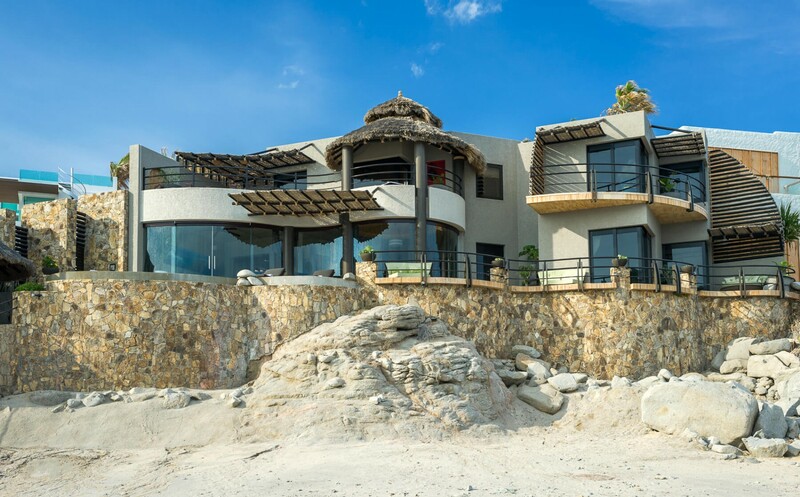 Medano Beach is Cabo’s main beach, which is a short 400-yard walk from Casa Arrecifes. The surrounding towns offer an abundance of dining opportunities in delicious Mexican restaurant and bars. The villa overlooks Land's End promontory which is past the marina. This is the famous arch where the site of Playa del Amor (Lover's Beach) and El Arco create a natural connection in the sea cliffs.